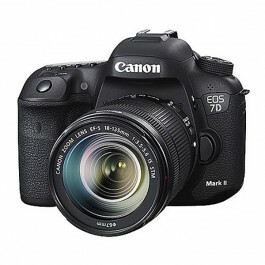 This week Camera Hire is excited to welcome the brand new Canon EOS 7D Mark II DSLR. With its APS-C-sized 20.2MP CMOS sensor, dual DIGIC 6 image processors, and a top continuous shooting rate of 10 fps, the 7D Mark II performs in a range of challenging situations. The combination of the dual image processors along with the CMOS sensor also contribute to enhanced low-light sensitivity to a native ISO 16000, which is further expandable to ISO 51200. Complementing the 7D Mark II’s still imaging assets, support for recording full HD 1080p video is available, in multiple frame rates up to 60 fps. MELVILLE, NY: Canon, a leader in digital imaging solutions, is proud to introduce the EOS 7D Mark II Digital SLR camera, incorporating professional features and quality in an affordable DSLR. Building upon the proven success of the EOS 7D camera, this new EOS model features a range of “EOS firsts” such as Dual DIGIC 6 Image Processors for superb image quality and rapid burst shooting up to 10 frames per second (fps), as well as Canon’s first 65-Point* All Cross Type autofocus (AF) system for compositional freedom and accurate, spot-on fast focus. Great for shooting indoor activities such as sporting events, concerts, or weddings, the camera’s impressive low-light shooting capabilities along with its up-to-10 fps high-speed shooting can capture a fast-break basketball dunk, a band’s encore performance, a bird in flight or wildlife in exceptional quality. In addition, the EOS 7D Mark II is the second EOS DSLR camera to incorporate Canon’s innovative Dual Pixel CMOS AF system for rapid and precise focusing of video as well as still images. Within the camera’s durable magnesium alloy body resides a newly developed 20.2 megapixel APS-C Canon CMOS sensor and Dual DIGIC 6 Image Processors, safeguarded by enhanced dust and weather resistance to protect the camera. Ideal for shooting in challenging lighting conditions ranging from indoor sports to dimly lit weddings, the camera features a standard ISO range of 100-16000 for both still and video (expandable to ISO 51,600). A new 65-point* All Cross-Type AF system with EV -3 sensitivity at the centre point helps deliver sharp focus for still photos even in extreme low-light conditions on subjects with limited visible detail. The EOS 7D Mark II camera also features an enhanced version of Canon’s EOS iTR (Intelligent Tracking and Recognition) AF, originally introduced with the EOS-1D X DSLR camera, enabling the camera to recognise subjects based on face and colour detection utilising the new AE system, and can track subjects using all 65 AF points. At 10 fps, the camera’s buffer capacity can consecutively capture up to 31 RAW images or 1,090 Large Fine JPEGs. Built to last, the camera also features a shutter durability rating up to 200,000 cycles, approximately thirty three percent more than the original EOS 7D camera. A newly developed mirror mechanism uses motorised control to help reduce impact and enhance camera performance during high-speed continuous shooting. In addition to adjustable high- and low-speed continuous shooting modes, single-frame shooting and two self-timer settings, the EOS 7D Mark II camera also features silent drive modes for single frame and continuous shooting. The silent settings support discreet camera operation in quiet locations. The EOS 7D Mark II camera’s advanced AE system can detect and compensate for flickering light sources such as sodium vapour lamps that are often used in gymnasiums and indoor swimming pools. When enabled, this system automatically adjusts shutter release timing to help reduce disparities in exposure and colour especially during continuous shooting. The EOS 7D Mark II camera features the next generation of Canon’s exclusive Dual Pixel CMOS AF (DAF) technology, originally introduced with the EOS 70D DSLR camera. New DAF features include user-selectable adjustments for Movie Servo AF Speed and Movie Servo AF Tracking Sensitivity. Additionally, overall focusing speed, face detection performance, and performance in low light and with low-contrast subjects have been improved over previous Canon models. Dual Pixel CMOS AF employs proprietary Canon sensor technology in which effective pixels are able to perform both imaging and phase-detection focus measurement simultaneously to achieve dramatically improved AF performance in both video and Live View still imaging modes. With Canon’s Dual Pixel CMOS AF system and customisable Movie Servo AF, the camera provides continuous phase-detection AF during video recording for quick and accurate focus tracking of moving subjects over approximately eighty of the image area measured horizontally and vertically. DAF focusing modes include Face Detection with Tracking, FlexiZone Multi with 31 AF zones, and FlexiZone Single that allows users to position a focusing frame on the camera’s LCD screen. Canon’s DAF supports over 100 models of Canon EF lenses (including many earlier models), providing a wide array of options for photographers to explore. The EOS 7D Mark II Digital SLR camera provides a wealth of creative controls building on the features and functions of the EOS 5D Mark III and EOS-1D X professional digital cameras. The new camera’s AI Servo AF III autofocusing algorithm is similar to that of the EOS-1D X camera in that tracking parameters (tracking sensitivity, acceleration/deceleration tracking, and AF point auto switching) can be easily customised for specific shooting situations, using the same type of AF Configuration Menu. This capability makes it easy for EOS 7D Mark II camera users to match AI Servo AF settings when used together with EOS-1D X and EOS 5D Mark III cameras, while also providing a high level of performance at an affordable price point. A new and improved Intelligent Viewfinder provides approximately one hundred percent field of view, while adding the ability to superimpose a customisable selection of camera settings data such as dual-mode electronic level display, grid, exposure mode, white balance mode and AF mode. A bright, three-inch Clear View II LCD monitor (approximately 1,040,000 dots) on the back of the camera displays information and menus clearly even in bright sunlight. The EOS 7D Mark II camera is compatible with interchangeable focusing screens including the standard Eh-A as well as the optional Eh-S Super Precision Matte for use during manual focusing with large aperture lenses. A built-in GPS Receiver provides a digital compass and can record location information including longitude, latitude, elevation, camera direction and universal coordinated time (UTC) as EXIF data for geotagging both images and movie files in real time. The built-in pop-up flash is convenient for many applications and can also act as an optical controller with compatible off-camera EX-series Speedlites for enhanced pro-quality lighting effects. Canon’s Stepping Motor (STM) lenses, such as the EF-S 18-135mm f/3.5-5.6 IS STM lens, significantly reduce focus motor noise, letting the EOS 7D Mark II camera’s built-in microphone capture clear audio of the scene being shot without picking up unwanted noise from the lens. The EOS 7 D Mark II camera also features a stereo microphone port and outputs stereo audio via the camera’s mini-HDMI port. The EOS 7D Mark II Digital SLR camera is equipped with a headphone jack for real-time audio monitoring, as well as a silent control feature that allows users to adjust audio levels during recordings. Other built-in ports include a PC socket for external flash units and an N3 socket for dedicated Canon wired remote control accessories. A cable protector is provided to maximise safety when using the USB 3.0 and mini-HDMI ports.